Griffins are supposed to be extinct. So when Yukiko and her warrior father are sent to capture one for the Shōgun, they fear that their lives are over – everyone knows what happens to those who fail the Lord of the Shima Isles. But the mission proves less impossible and more deadly than anyone expects. Soon Yukiko finds herself stranded: a young woman alone in her country’s last wilderness, with only a furious, crippled griffin for company. Although she can hear his thoughts, and saved his life, all she knows for certain is he'd rather see her dead than help her. Yet trapped together in the forest, Yukiko and the beast soon discover a friendship that neither of them expected. Meanwhile, the country around them verges on collapse. A toxic fuel is choking the land, the machine-powered Lotus Guild is publicly burning those they deem Impure, and the Shōgun cares for nothing but his own dominion. Authority has always made Yukiko uneasy, but her world changes when she meets Kin, a young man with secrets, and the rebel Kagé cabal. She learns the horrifying extent of the Shōgun's crimes, both against her country and her family. Returning to the cuty, Yukiko is determined to make the Shōgun pay – but what can one girl and a flightless griffin do against the might of an empire? I'm so in love with this book, partly because it's based in based on Japanese mythology! From the moment I read the summary a few months ago, I knew I have to read this, no matter what and I did! Finally! And oh my, this book is fun and enjoyable! So you know Yukiko from the summary, about what she and her group has to do for the Shogun--an impossible task. How do one find a griffin when it's extinct? However, they still have to go on a journey to find the creature or face the Shogun's punishment. I find it difficult to get past the first few chapters, possibly due to the terms used. Nevertheless, it served as important background information to us. It got a lot better afterwards and everything flowed smoothly. I really like Yukiko's personality--brave, loyal and kind. The highlights of the book--the arashitora. 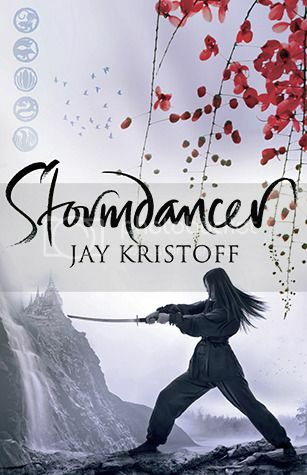 You'll have to read the book to know what that is and I'm sure you'll not regret picking up Stormdancer! I want to read this book so bad! Hope I'll get the chance to read it soon.